The Multiple Input Output module (MIO) is a universal, modular controller for use both in the industrial and automotive fields. 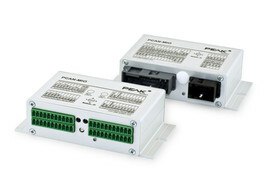 The module has two CAN interfaces as well as multiple analog and digital inputs and outputs. Incoming signals can be processed by the microcontroller and then forwarded to the CAN interfaces or output channels. For this purpose, the behavior of the PCAN-MIO module can be freely configured using a comprehensive Windows® software. A large number of function blocks and other settings are available to help the user in creating such a configuration. A bus structure also enables expansion of the number of inputs and outputs with additional modules. Customer-specific requirements can be implemented in doing so. The configuration requires a PEAK CAN interface.